This is the paperback pocket edition of Tony Hillerman's Finding Moon, translated into French by Danièle and Pierre Bondil, and published by Éditions Payot & Rivages in 1998. 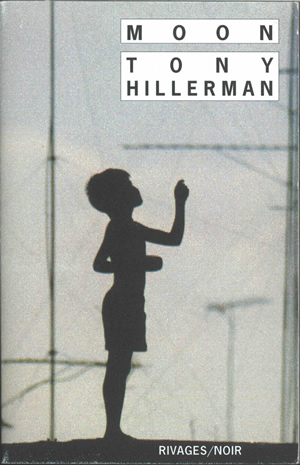 The front cover features the silhouette of a child with one arm raised, against a background of electrical pylons and wires in a pale grey sky. The novel title and author's name are printed in black on white rectangles near the top right of the front cover. The publisher's imprint is in white on a black band along the bottom of the cover. On the back, printed in black capital letters on white, is a synopsis of the novel, the translation and series credit, and book bar code. The inside front and back covers are blank. Binding: Black and white paper covers. The title, author's name and publisher's imprint are printed in black on the spine.